McGill’s Dr. Alan Evans and Dr. Nahum Sonenberg will receive over $3.7 million for research focusing on autism spectrum disorders (ASD) and fragile-x syndrome (FXS), with a goal to develop new diagnostics, treatment and prevention strategies for these disorders, as announced by Prime Minister Stephen Harper on May 1. “This is what I call a win-win situation, and it’s a lot more than a ‘penny for your thoughts,’” said Prime Minister Stephen Harper from the Palais de Congres. The new investment from the Azrieli Neurodevelopmental Research Program, funded by The Azrieli Foundation, the Brain Canada Foundation and the Government of Canada through the Canada Brain Research Fund will aim to develop new diagnostics, treatment and prevention strategies for these disorders. The Prime Minister made the announcement following a tour of renowned neurosciences researcher Dr. Nahum Sonenburg’s lab at McGill’s Life Sciences Complex. Dr. Sonenburg will receive $1,235,000 to test treatment strategies for ASD and FXS on mouse models. 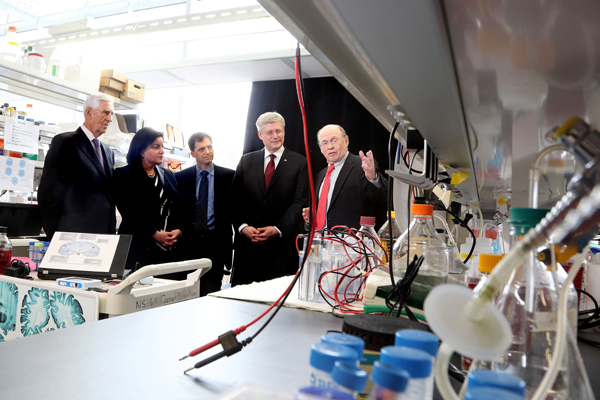 Students working in the lab took time out to meet Prime Minister Harper and chat briefly about the importance of the brain research taking place there. McGill’s Chancellor, Arnold H. Steinburg and Dr. Rosie Goldstein, VP (Research and International Relations), as well as André Chagnon, Canadian businessman and philanthropist and a multi-million dollar investor in research on Alzheimer’s disease, and Naomi Azrieli of the Azrieli Foundation accompanied Prime Minister Harper on the tour. The University of Toronto’s Dr. Benoit Mulsant, recipient of funding from the Chagnon family for research on Alzheimer’s, also presented his research project to the Prime Minister. “We were quite amazed by the response we received to the visit,” said Inez Jabalpurwala, President and CEO at Brain Canada Foundation, the only non-profit organization devoted to brain research. It was the Prime Minister’s first visit to McGill. While the issue of brain disorders may have a low public profile, according to Brain Canada, there are roughly 16.5 million Canadians whose families are affected by brain disorders. Naomi Azrieli, who spoke at the announcement on behalf of The Azrieli Foundation emphasized that the importance of this research is not only about addressing these staggering statistics and the societal cost of brain disorders, but the difference it will make for those living with brain disorders and for the family unit supporting them. “It begins with the “shock of diagnosis,” she said. It’s a shock her family has experienced personally and a story she has written about in order to raise awareness of FXS. FSX is the most common inherited genetic condition and causes a range of developmental problems, including learning disabilities and cognitive impairment. Though few may have heard of the condition, Brain Canada estimates that FXS affects 1 in 4,000 boys and 1 in 6,000 girls of all races and ethnic groups. Individuals diagnosed with FXS have a normal life expectancy, however they require more support and care throughout their lives. “Millions of Canadians will suffer from neurological illnesses during their lives, impacting their families and their communities. Our Government is using innovative new public-private partnerships to stretch dollars being used to improve the neurological and mental health of Canadians,” said the Prime Minister. In addition to the funding for the five projects being announced today, the Azrieli Foundation also announced it will increase its investment into the overall fund to $15 million, which will be matched by the Federal Government. With this increased investment in McGill’s brain research, Dr. Evans sees hope for improving the quality of life for people living with complex conditions like FXS and ASD.